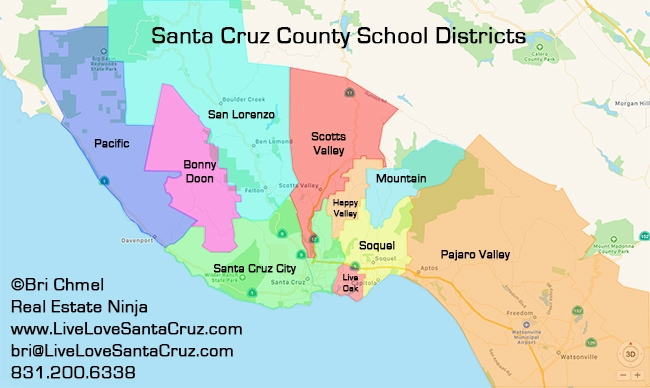 Santa Cruz County School Districts - THE BREAKDOWN! Hello from Bri Chmel, Realtor® & Owner at Live Love Santa Cruz! When some of my first clients started asking me questions about the school zones in Santa Cruz County, I got online and started to do my research. What I found was confusing, and there was no website or map that had all of the information in one place. So I decided to make my own informational page all about our school districts! Each one of these schools is an actual link to their page, so feel free to click away. Also, when performing a home search on my website and upon clicking on a home, you will see the school district information for that particular house and neighborhood at the bottom of the page, see below. Live Love Santa Cruz home search provides school information on each home you view in your search! There are 26 public high schools in Santa Cruz County, California, serving 12,742 students. Santa Cruz County, CA public schools have a diversity score of 0.31(the chance that two students selected at random would be members of a different ethnic group, scored from 0 to 1, a diversity score closer to 1 indicates a more diverse student body) which is lower than the California average of 0.41. What Makes Santa Cruz SOOOOO Special?